Building an online presence is something of an absolute necessity. As the whole world shifts to a digital environment, you have to be available online and also easily reachable. Kicking off our list we have the Observe Theme coming from Theme-Stop. It is designed to deliver the best possible SEO performance as well as heightening the session duration time of your website by keeping visitors engaged. For increasing user engagement, the theme focuses on tactics to boasts all the content you have on your website so that readers can find something they like. First of all, it boasts a grid view which displays all the content to your readers. Then there is also a view counter which showcases how many times each post has been read, so users can find something engaging. The theme comes with finely integrated social sharing buttons which helps users share with friends articles and posts they find interesting. Option to showcase related posts and popular posts which can keep users engaged for longer. Custom Widget support to help make your website even more feature rich. Adsense optimization tool to help monetize the increased traffic. Divi is more than a theme and in fact a full-fledged website building platform. Although you need to have WordPress to make it work, but once installed, everything can be managed from the frontend. You will be able to design gorgeous layouts, all of which will be completely SEO ready. 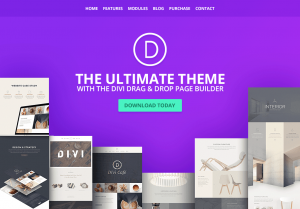 The main selling point for Divi would be the Divi page drag and drop page builder which lets you simply drag and drop different modules to build your site. It is like building your Lego masterpiece. There is an extensive list of modules which will never make you feel like you are compromising on something. And even with so many options and functionalities, everything is offered in an organized fashion which is very much appreciated. 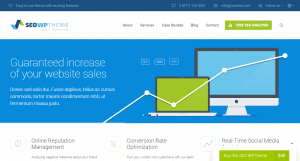 One of the most customizable themes in the market which give you total control on how you want to build your website. An extensive list of modules which you can incorporate into your website, along with plenty of ready made demo websites as well. No matter how complex a page layout you create, the theme is highly SEO optimized and will help you get favorable rankings online. Schema WordPress theme is well known as a fast loading, SEO friendly theme for WordPress website and blogs. It also boasts a responsive design, comes with an inbuilt ad management system, review system, and much more. It’s customizability features allow the theme to be used in a multitude of use cases, but it is ideal for building review sites, blogs, and general purposes websites. There is also the option to include a shop on your website if that is something you require. Besides being heavily featured, everything is also properly arranged which makes it super user-friendly. This is one of the ideal themes for beginners. However, there are many other functionalities such as Custom CSS support which also makes the theme viable for advanced level developers. The theme is very friendly with Google Algorithms. The theme is coded with the best coding practices making it very light and extremely fast loading. Customization options are sufficient enough to make a blog/site that truly stands out. SEO WP is a specifically designed theme for Digital Marketing agencies which is highly SEO-friendly and offers effective social media tools. If you are planning to build a Digital Marketing agency online, or anything similar to an SEO company, or Social Media Freelancer, then this offers a ready-made solution for your needs. The theme also comes with a host of different premium plugins which will save a total of $186 on the entire purchase. Some of its most useful plugins to help you expand your business would be Easy Social Share buttons, Google Position Tracker, NF MailChimp Opt-ins. There are many more plugins which are there to help you fine-tune the aesthetic appeal of your website. It is a super fast loading theme which is known to enhance a website’s performance. SEO related plugins provided which can help you track your Google search rankings and make improvements accordingly. You will get access to a bunch of content modules which will help you to promote your services. 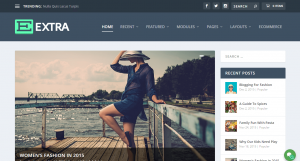 Extra is a Magazine theme for WordPress users which is powered by the Divi builder. Generally, magazine-based websites heavily depend on aesthetic values and appearances. And powered by the highly capable Divi drag and drop page builder, the theme doesn’t disappoint one bit. Apart from helping you build an awesome looking website, the theme is also WooCommerce ready, when means you can have an online store on your website. There is also the freedom to include project portfolios, custom blog post layouts, product reviews, and much more. If you intend to build an SEO optimized magazine website, then we would recommend that you go ahead and buy the Extra Theme which offers a ready-made solution catering to your needs. Extra content modules which are specifically curated to help with the needs of bloggers and online publications. The theme is also highly customizable, which gives you the freedom to prepare any layout style for your website. There are also plenty of other modules and options which helps to make your website as rich as possible. 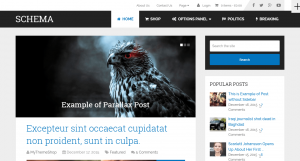 And that’s the end for our roundup of the Best SEO Optimized WordPress Theme. Hope you found this read to be helpful, and if so, do share it along with your friends who also plans to expand their online presence. Also, if you are already a user of any of the themes we mentioned here, then do give us feedback on the comments section. Your fellow readers will love to hear about individual/personal experiences. Final note if you are just new to the whole concept of blogging you might want to check out this roundup of the most popular blogs in numerous industry.